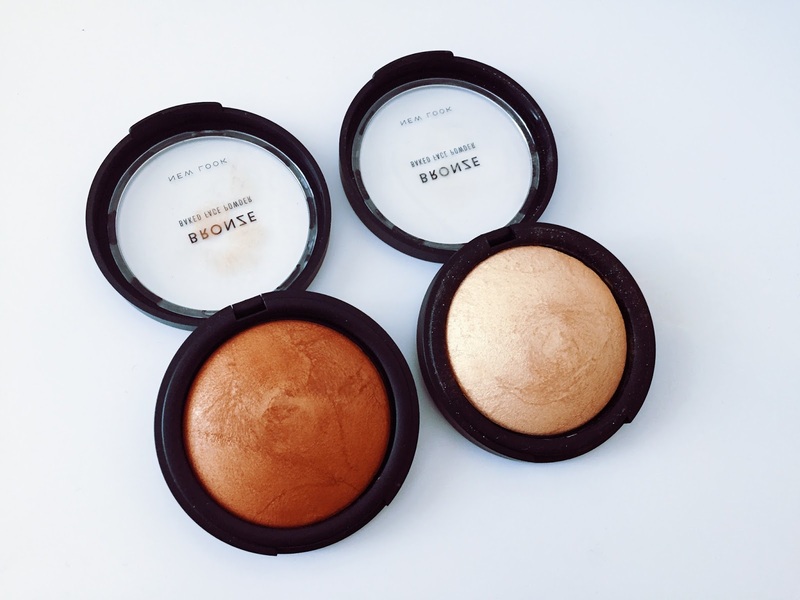 New Look Bronzers - Hit or Miss? I have never purchased beauty products from New Look before and it's only recent that I have started buying into New Look fashion. I discovered these bronzed baked face powders when I was flicking through ASOS and they looked really good online! I have been trying them out for the last two weeks. So I wanted to share my initial thoughts on these products. I purchased two shades - Bronzed and Golden Glow. When I received them my first thoughts were that they looked decent quality and they also reminded me of the Mac Cosmetics skin mineralizing powder from the shape and overall look of the product and the cardboard packaging. They are pigmented and have a great shine to them. Perfect for the summer time. They are long wearing and easily blend-able. Each bronzer was £4.50 on ASOS, I'm not sure if this is due to a sale or whether they are just more affordable online. They cost £7.99 in the New Look stores. You can use these products in various different ways. Contouring, eyeshadow, highlighter and of course as a bronzer. I did find that when I used them there was a lot of fall out. They are slightly powdery rather than silky. I prefer my bronzers to have more of a buttery feel. The plastic packaging isn't very appealing. Although the overall product looks similar to Mac's, the packaging doesn't. It's not so sleek. The Golden Glow bronzer isn't a bronzer at all, it's more of a highlighter which is nice but a very confusing product. Would I say it's the best bronzer I have ever purchased? No, but it is definitely a great product for the money. Bronzed is a nice bronzer and definitely one I would use again. Golden Glow's not so great but I would reach for it to use as a highlighter. I honestly wouldn't buy this product again. I just think there are better bronzers out there. However, if you're looking for a more affordable product then definitely check these out. I will recommend the highlighter from new look until the cows come home! You should definitely try it out. I have one of the bronzers but don't tend to use it.